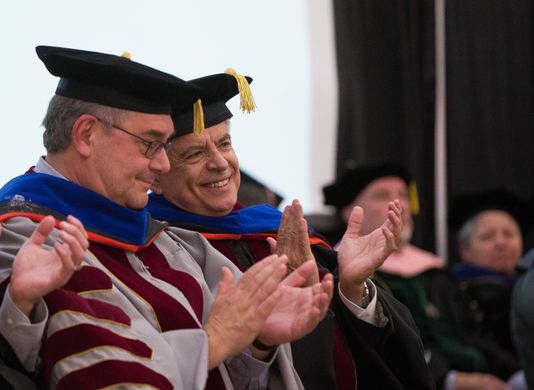 NMSU Chancellor Dan Arvizu and John Floros celebrated their inauguration with local community members Thursday afternoon at Corbett Center. Arvizu was inaugurated as the university’s second chancellor and Floros was inaugurated as the university’s 28th president during the traditional academic ceremony. The event included a series of guest speeches by university officials and local community leaders, a blessing by Tortuga Pueblo members, and performances by the the Sol y Arena flamenco dance group, the NMSU Wind Symphony and NMSU Chamber Singers. The list of guest speakers included Gov. Susana Martinez, Las Cruces Mayor Ken Miyagishima, and ASNMSU President Emerson Morrow. Former chair of the Colorado Public Utilities Commission Joshua Epel delivered the keynote speech. Chancellor Arvizu is the former director and chief executive officer of the U.S. Department of Energy’s National Renewable Energy Laboratory, and most recently served as senior adviser to the Emerson Elemental practice of Emerson Collective, a nonprofit based in Palo Alto, California. He holds a bachelor’s degree in mechanical engineering from NMSU and a master’s and Ph.D. in mechanical engineering from Stanford University. President Floros served as the dean of the Kansas State University agriculture college and K-State Cooperative Extension before coming to NMSU. He earned his Ph.D. in food science from the University of Georgia.